Square Enix has revealed that Kingdom Hearts 3D, for the Nintendo 3DS, will feature a set of flashbacks of past Kingdom Hearts games for newbies of the series. There’s a feature in the game called ‘Recollections’ which allows players to catch up or study with what happened in Kingdom Hearts: Birth By Sleep, Kingdom Hearts, 358/2 Days and the rest of the past Kingdom Hearts games before it. Kingdom Hearts is the first game in the Kingdom Hearts series directed by Tetsuya Nomura. Revolving around a fourteen-year old boy named Sora, it details his adventures after his home world is destroyed by sinister creatures known as the Heartless, and his attempts to restore his world and reunite with his friends. In the process, he meets many characters from classic Disney films and a handful from the Final Fantasy video game series. Kingdom Hearts 3D is set to release next month in Japan, and is due sometime later this year in the rest of the world. Kingdom Hearts 3D will be a canon story, not a side story, and it's said that the story will have an impact on Kingdom Hearts 3's story. North American Fans will be pleased to hear that KH3D is already under localisation but no date has been confirmed. The game will feature heroes from both Kingdom Hearts and the World Ends With You. 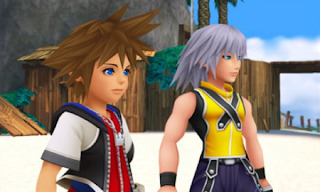 Gamers will play as Sora and Riku, so far seven worlds have been confirmed, some worlds are from classics like Prankster's Paradise, Country of the Musketeers, Symphony of Sorcery and brand new to the Disney collection is The Grid from Tron Legacy. Instead of having the likes of Donald and Goofy at your side you have these creatures called Dream Eaters, these cute little demons will be your aid in the game. They are Wonder Meow, Bat Bat. Riku's is Bat Bat, Kuma Panda. The game will have limits on both Sora and riku not much info is been said about this. A gauge called the drop gauge will deplete after a certain amount of time time causing you to switch from Sora to Riku. For example: when Sora is in one world and the gauge gives out, the player will be forced to then play as Riku in a another world. Sounds confusing right? It should be simple enough in practise, it's certainly an interesting gameplay partner system to use.